Thankfully, the Castle Combe Autumn Classic did not clash with the Trackrod Rally in 2017 and this was all the incentive I needed to make a first visit to the relatively little used Wiltshire Circuit. 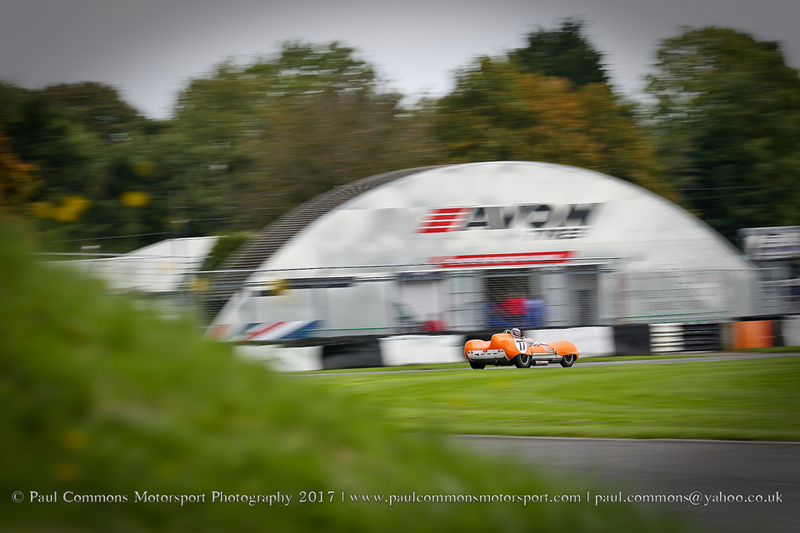 Now in it’s sixth year the 2017 running of the Autumn Classic included 7 excellent races, headlined in many respects by the wonderfully diverse field of machinery taking part in the 1 hour long GT & Sports Car cup; 39 cars doing battle across many different classes around the 1.85 mile circuit a mouth watering prospect if ever there was one! 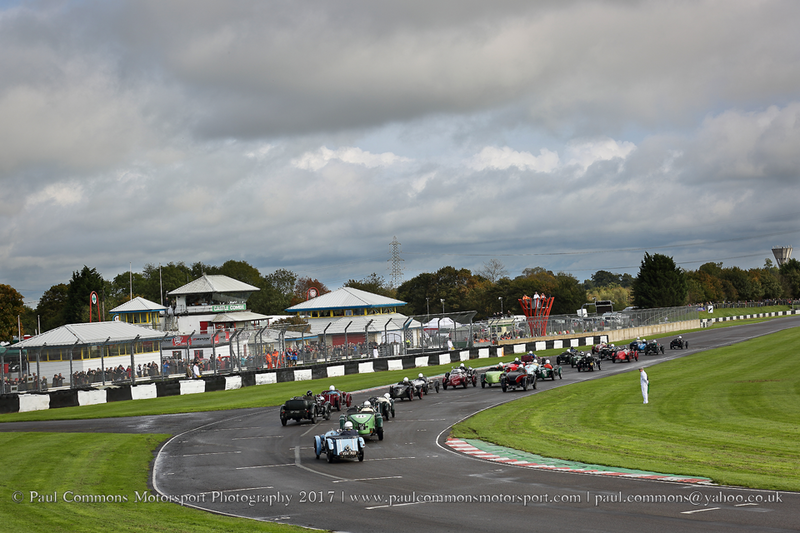 After a soaking wet morning, the clouds began to lift as midday approached; the damp track proving quite a challenge for the Formula Vintage Pre War Sports Car runners in the first race of the day. Indeed, the safety car was required as early as lap 2 after Trevor Swete just failed in his attempts to keep his Invicta out of the Camp Corner tyre barrier. Once the track returned to green however, there was really only going to be one winner; Patrick Blakeney-Edwards putting on a fantastic sideways display as he headed home a Frazer Nash Super Sports 1-2. Mark Gillies in his Aston Martin had managed to jump both Blakeney-Edwards and the second Frazer Nash of Edward Williams at the re-start (illegally as it turned out) but was back in third by the end of the lap, such was the pace of the eventual front two. Tim Kneller would in the end round out the podium positions in his Riley TT Sprite following a 30 second penalty for Gillies’ re-start infringement. After a lengthy break for tyre wall repairs at Camp corner, the second race of the day for the 500cc F3 cars would commence in fully dry conditions. And whilst Sir John Chisholm had been mighty in the wet to claim pole position he quickly fell behind the leading machines at the race start. In fact it would be the 2 Starides of Xavier Kingsland and Darrell Woods who would break away from the field; Woods eventually passing Kingsland at Tower on lap 3 before going on to record a comfortable 10 second victory. Stuart Wright in his Cooper MK11 would round out the podium positions. 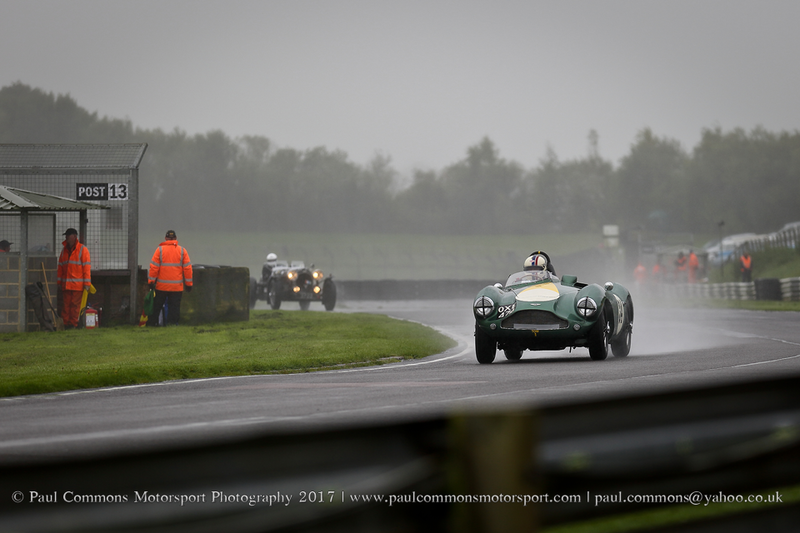 Qualifying in very wet conditions had produced a topsy turvy Pre-66 Jaguar grid with Kevin Zwolinski in his XK140 finding himself sharing the front row of the grid with the Jaguar MK2 of Peter Dorlin. It wasn’t long before the E-types rose to the fore during the race however as Grant Williams lead from Harry Wyndham by the end of lap 2. In fact Wyndham, after starting on the fifth row of the grid, would find himself in the lead of the race by the end of lap 5 and whilst not able to break away from his local rival, a great performance from Wyndham saw him maintain the lead right up until a red-flag brought the event to a slightly premature end on lap 18. 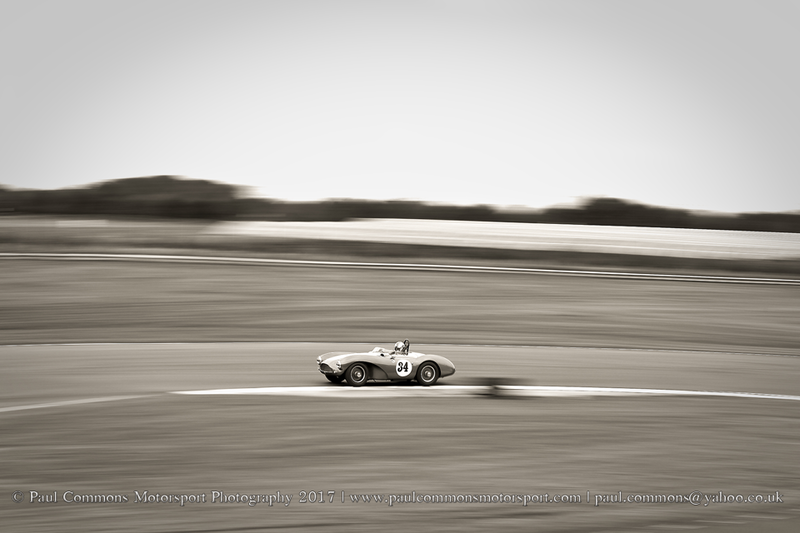 Chris Milner in another E-type rounded out the podium positions whilst Richard Butterfield claimed the Saloon class win, in his Jaguar MK2, with fifth position overall. In the John Gross Memorial Race for Aston Martins, Steve Boultbee-Brooks and Martyn Corfield would quickly break away from the rest of the field, with Boultbee-Brooks in his glorious DB3s just having the edge over Corfield’s Frazer Nash as he went on to record a relatively comfortable 5 second victory. The front two really were in a class of their own however with Chris Woodgate in his DB MK3 almost a lap in arrears as he rounded out the podium positions. 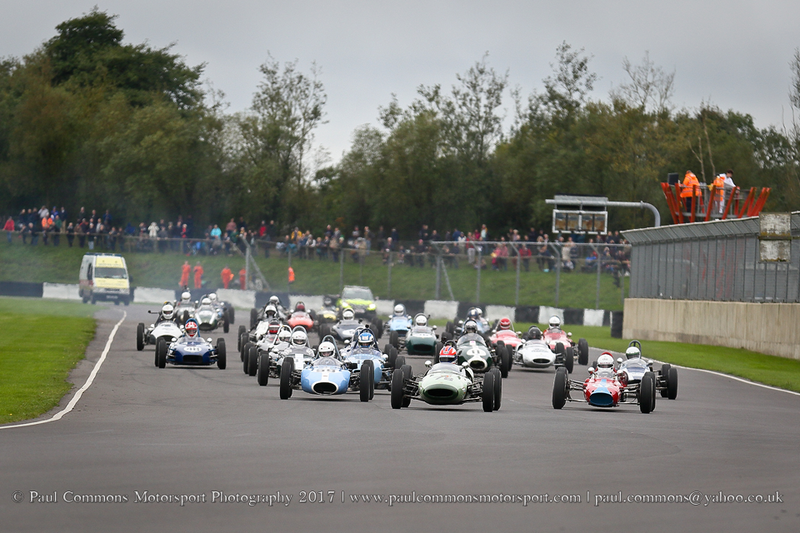 The Formula Junior machines were in their element around the fast Wiltshire circuit and, having won for the first time at Oulton, Benn Tilley would again find himself standing on the top step of the podium. Following an early safety car, Westie Mitchell in his De Tomaso, had looked a strong candidate for victory as he quickly passed Peter De La Roche and was on the tail on the leader. A spin at the far end of the circuit put pay to Mitchell’s challenge however leaving Tilley to wrap up another victory in his Lotus 22; 3 seconds to the good of pole sitter Peter De La Roche in the BMC MK2 with Richard Smeeton in his Wainer 63 completing the podium. Making it’s debut at the Autumn Classic, the 1 hour long, GT & Sports Car Cup centrepiece would be the penultimate race on a busy schedule and again the morning rain produced a somewhat unconventional grid. 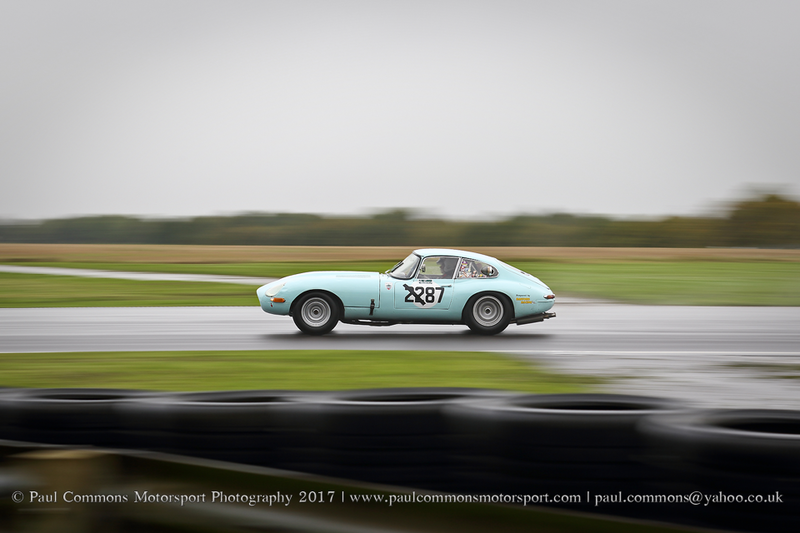 Indeed earlier in the day Nigel Greensall had produced a stunning lap to place the GT3 spec E-type shared with Chris Milner on pole position but as anticipated Milner could not keep the higher specification cars behind on a dry track. Instead it was Philip Walker in his Lotus 15 who lead the early running from 4th row starters Mark Williams in a Cobra and Ben Adams in his Lola MK1. But after initially breaking away, Walker soon had the chasing two on his tail and sure enough on lap 7 both Williams and Adams had snook by. Williams’ lead was short lived however as a mix up with a back marker would drop the Cobra pilot back to fourth; thus leaving Ben Adams to develop a reasonable lead before his pitstop. Tackling the event on his own, Adams would find himself disadvantaged in pitlane (having to endure a 1 minute minimum stop) and this allowed Miles Griffiths, taking over the Lotus 15, to emerge in the lead as the race entered the second half. In fact, the Chris Wilson/Nigel Williams Cobra had also managed to jump Adams in the stops but Adams’ superior pace soon saw him back in second. There was absolutely nothing the Lola pilot could do about Griffiths though; the Lotus 15 man now setting the track alight as he and Walker went on to record a very comfortable 53 second victory. Even without the pitstop disparity, Adams would have struggled to match the pace of Griffiths; second place and top spot in SP1 therefore a great result for the little Lola. Elsewhere, Mark Williams was able to reel in the ailing Wilson/Williams Cobra to claim GT4 honours with third position overall whilst pole sitter Greensall just managed to hold off a late challenge from Patrick Blakeney-Edwards to claim an excellent fourth and top spot in GT3 for he and Milner. Malcolm Paul and Rick Bourne meanwhile came out on top of the TVR Grantura battle to claim GT2 top spot with 16th position overall. In the final event of the day, Steve Boultbee-Brooks would again take his Aston Martin DB3s to victory in the FISCAR Historic Intermarque race. The win was a little less clear cut on this occasion however as the Aston Pilot was required to fend off not 1 but two very rapid Lotus Elite’s in order to claim top spot. Indeed the Barry Dye / Richard Fores driven Lotus even had a spell at the front before slowing in the second half of the race. And despite Boultbee-Brooks emerging from his stop with a healthy lead, he would find the margin evaporate over the remaining laps as Robin Ellis, in the second Elite, closed the gap to just over 3 seconds by the time the chequered flag was waved. There was no stopping Boultbee-Brooks on the day though; 2 pole positions, 2 fastest laps and 2 victories from the 2 events entered represented a great day in the office! There were many things to enjoy about my first visit to Castle Combe but what stood out the most was the sheer simplicity of the venue; the uncomplicated nature of the track (essentially just three corners with very limited run-off) creating some of the best racing witnessed all year, viewed from the excellent circuit wide spectator bankings. It felt like a throw back to my childhood, even more so when the winners were taken on a lap of honour by the open top bus; something which I do not remember seeing in a long time! I have a feeling this will not have been my final visit to the Wiltshire Circuit.